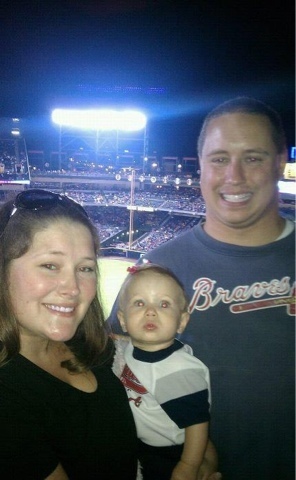 We took Sweet Pea to her first Braves game yesterday. Hubby didn't want us to go. I think because he wanted to go by himself. I insisted because I don't care that I am breastfeeding. I feel like sometimes he uses that against me so I have to stay at home and he gets to go out all the time. Regardless of what he thinks, he needs to either realize we should do stuff as a family or he should stay at home with us as a family. Anyways even Hubby said Sweet Pea was perfect and that it was fun.